A little Carolina Wren has found the birdhouse on the crabapple tree and is inspecting it as a suitable place for its nest. 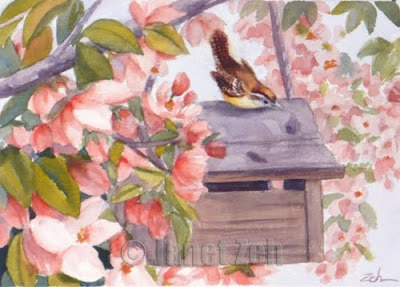 I was inspired to do this painting because I have just hung up the birdhouse. Every year it is home to several families of wrens or chickadees. Soon there will be a new batch of chicks this Spring. Thank you! I'm pleased with how this painting came out. It does make you think of summer, doesn't it?